The greatest mistake Yudhistira made in his life was to agree to play the game of dice with Duryodhana. He knew, the game wouldn’t be fair, but still he couldn’t refuse. 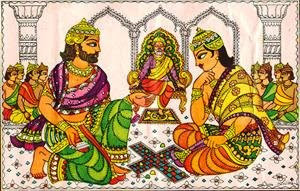 His excuses were, that he couldn’t say no to his uncle Dhritarashtra, and also he would never retreat when challenged. But was that the real reason? Listen to this episode and be the judge.